We have a great range of delicious chocolates and confectionery available to help you spread the love during the Valentine’s Day period, to surprise, delight and thank your customers. Make Valentine’s Day extra special for your customers on Thursday 14 February 2019 with delicious Valentine-themed Red Heart Chocolates, Strawberry flavour Jelly Heart Sweets and Chocolate Truffles in special Red and White decorative ‘Heart’ boxes. * to SHARE THE LOVE next Valentine’s Day 2019! 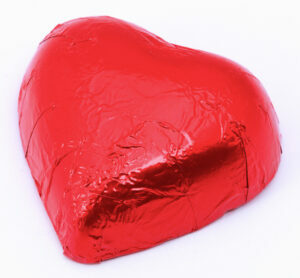 Delicious red-foiled Belgian Milk Chocolate Hazelnut Praline Hearts. £19.50 (ex Vat) per 1kg bag (approx 100 pieces). 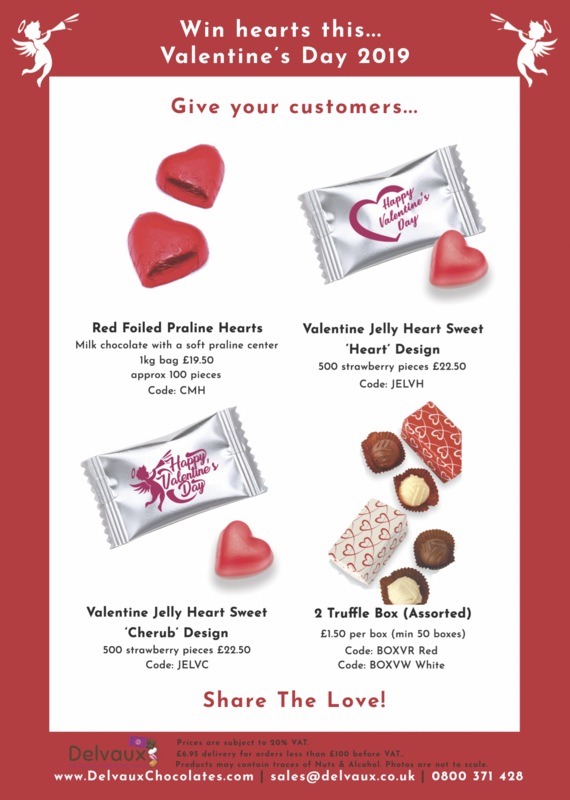 Please click on the link to see our full Valentine’s Day range and price list for 2019 and to order. 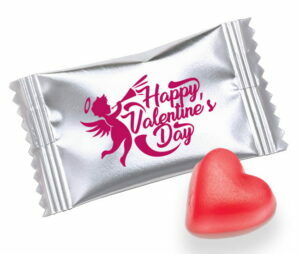 Fruity Strawberry flavour Jelly Heart sweets sealed in a silver flow wrap with a magenta print red ‘Cherub’ design and the message “Happy Valentine’s Day” in magenta print too. £22.50 (ex Vat) per 500 pieces. 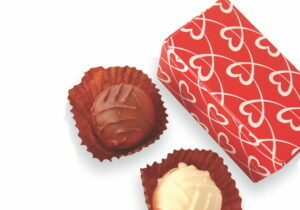 2 luxurious Chocolate Truffles (Assorted) in a white/red presentation box decorated with red/white hearts. £1.50 (ex Vat) per box (min 50 boxes). 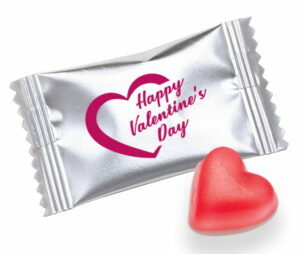 Fruity Strawberry flavour Jelly Heart sweets sealed in a silver flow wrap with a magenta print red ‘Heart’ design and the message “Happy Valentine’s Day” in magenta print too. Please call Richard or Kate on 01932 571180 to order, or email us.